Video: How to navigate and use the Property and Owner Profiles. PropertyRadar’s Property and Owner Profiles are jam-packed with an incredible amount of information and insights about properties and their owners, as well as handy tools and features for performing market analysis and adding your own information. In the upper left corner of the Profile, you will see property’s profile picture. It defaults to a street view but will update to the last photo you upload in Photos. To the right of the profile picture is a map showing the actual location. You will notice three small icons in the upper left corner of the map. You can zoom in and out of the map by clicking the magnifying glasses. You can also toggle back and forth from the aerial map view by clicking on the earth icon. By clicking the arrow icon in the upper right corner, you get a full screen view of the map. The three icons in the upper center of the map offer you a map view, bird’s eye view and street view of the property. You can also view heat maps and boundaries by clicking the layers icon on the left side. To go back to the Profile, all you need to do is click on the white back arrow in the upper left corner. In the upper right corner, you will see two icons that allow you to print reports or share reports via email. To the left of those icons are up and down arrows so you can scroll through the different Profiles in your list. Just below these icons you can quickly see if the property has been added to any of your lists, or has a status selected to help you organize your workflow. You can quickly add any property to a list by typing a new list name under My Lists in the upper right corner. If this section is blank, then this property is not on a list. To create a new list, type the list name and press enter. This creates a new static list. If you wish to add the property to an existing list, all you need to do is click the drop down arrow to select from an already existing list. To help you organize your workflow, you can use the Status drop down to select your next step. You can customize your status fields in user settings to better fit your workflow if needed. Savvy users use Status to save time and never miss a deal or opportunity. Property and Owner Profiles are organized through tabbed navigation so that it’s faster and easier to get the info you need. There are 4 tabs just below the profile picture and map including Overview, Property, Contacts, and Neighborhood. The Overview Tab gives you a quick summary of information about the Property and Owners, as well as the option to add and review photos. In the property section, is the property type, year built and characteristic information. You’ll also see icons indicating owner occupied, for sale, and in foreclosure. Under contacts, is the owner name and other information such as gender and age. You’ll also get a photo of that person when available and icons indicating what other kind of information we have. Including phone numbers & Social Media links such as Facebook, Twitter, LinkedIn and many more. 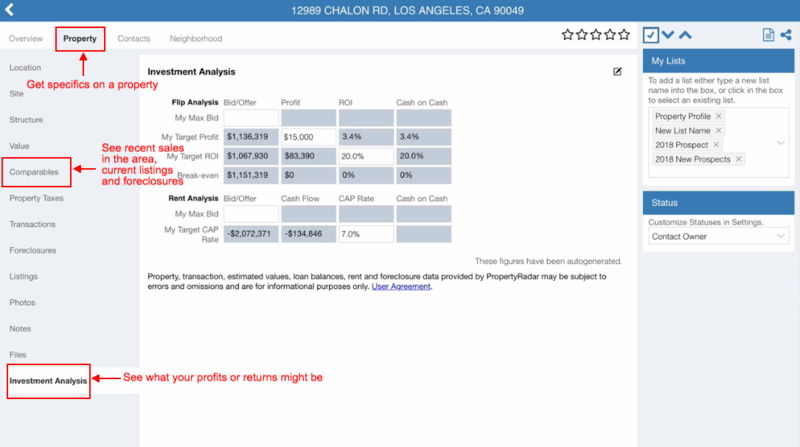 Under the Value section, you’ll get the current estimated value, estimated equity, and any information regarding the most recent purchase of the property. Under photos you can upload photos to remind yourself about the property. The Property tab gives you specifics about the location, site, structure, value, comparables, property taxes, transactions, foreclosures, listings, photos, notes, files and an Investment Analysis. You can quickly jump to each section by clicking the different tabs on the left. Comparables allows you to see recent sales in the area, current listings and foreclosures. You can use this to determine your own opinion of value, establish a reasonable list or offer price and see what nearby properties are in foreclosure. The Investment analysis tool allows you to get the financial information you need to make sound decisions on any property investment. Whether you are looking to flip or hold a property, the analysis makes it fast & easy to see what your profits or returns might be. Within the Contacts tab, you can review each property owner. 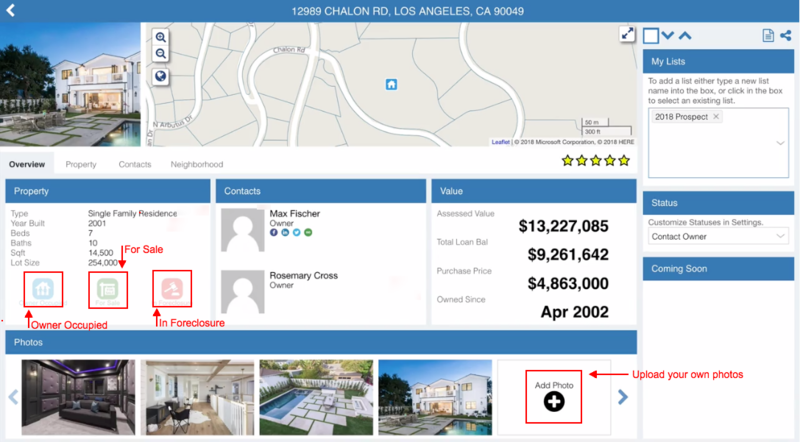 You can scroll through the property owners or use our tabbed navigation on the left side. 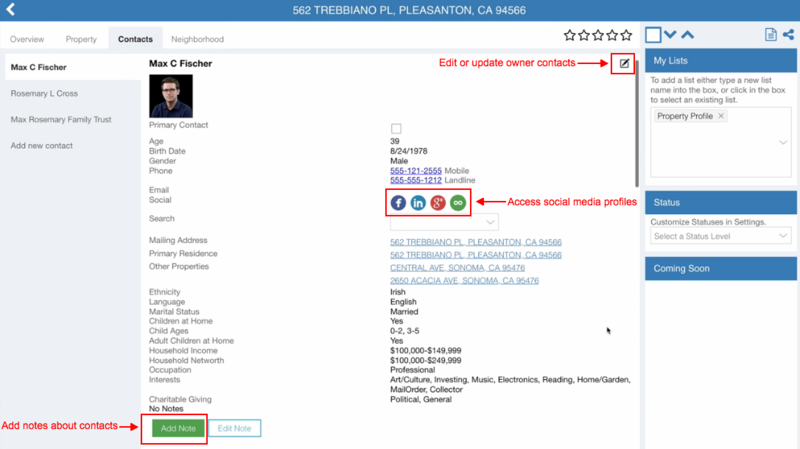 You can edit or update owner contact data by clicking on the edit icons throughout the page. When available, you’ll see the owners and phone numbers, various demographic data, including age, birth date, gender, ethnicity, whether or not there are children, how old they are, marital status, language, education, income, net worth, occupation, business details, interests and charitable giving. By simply clicking the various social media links, you can immediately access profiles to outside sites such as Facebook, Twitter, LinkedIn, and many more. You can also do additional research on the home owner by using the various links available from the search drop down menu. Knowing more means growing more. 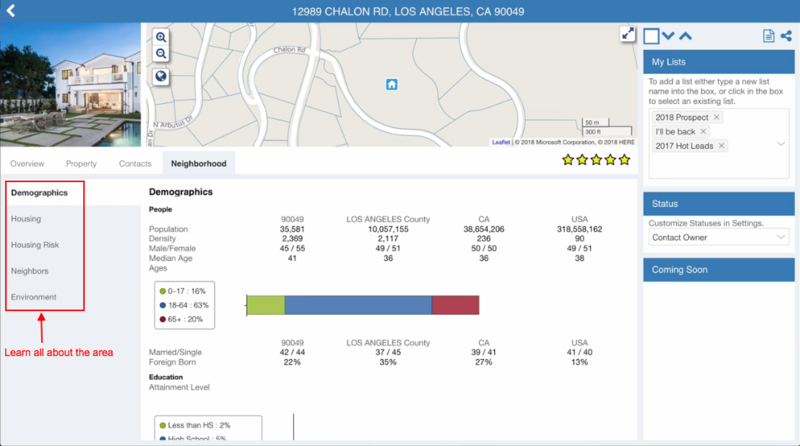 The neighborhood tab is where you can review demographics, housing details, housing risk, neighbors and the environment. This is great for getting to know an area you’re not familiar with or to educate a potential customer on an area that they’re not familiar with. The most successful businesses are always curious. Their advice to you: take the time to get familiar with all the discreet data and insights at your fingertips. You may not see or need to know it today, but you never know what tomorrow will bring. The more you know about the diverse data available, the faster and smarter you can act. Last thing to know - Profiles can be accessed from our mobile apps for iPhone and Android smartphones. All the same data and function – just resized to fit on a mobile screen. Never miss a deal with PropertyRadar in your pocket. As always, if you have any questions contact our support team. We’re happy to help!